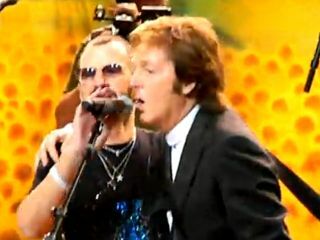 Paul McCartney surprised Ringo Starr last night (7 July) at New York's Radio City Music Hall, where the two former Beatles rocked with an absolutely jubilant version of the 'White Album' classic Birthday. The song was appropriate, of course, as yesterday was Starr's 70th birthday. Many in the crowd were unprepared for such a show-closing event. After the intended encore, which saw Ringo and his All Starr Band joined by Yoko Ono, Joe Walsh, Steve Van Zandt, AC/DC's Brian Johnson(! ), Jeff Lynne, Nils Lofgren, Max Weinberg, Foreigner's Mick Jones and others for With A Little Help From My Friends, people had begun to file out. But when a roadie appeared with a Hofner bass, the audience rushed back to their seats for the grandest of all finales. And in case you missed it, check out MusicRadar's salute to Ringo Starr with a video guide to 14 of his greatest drum performances.